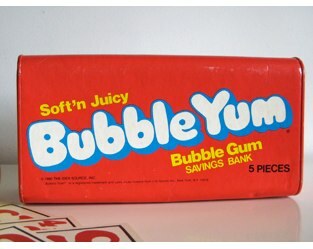 Gum was a little boring until Bubble Yum popped onto the scene. Wikipedia says it came out in 1975 although I could have sworn it was a 1980s invention. But whenever it came out, it was brilliant--most gum was pretty flat and ho-hum until then. Sure, there was Bub's Daddy (which I loved--giant stick gum) and individual gumballs and so on, but really, pack gum was forever changed by Bubble Yum. It was soft, it was fat, and it was oh-so-sweet. Plus it made darn good bubbles. Bubble Yum was quickly followed by Bubbilicious and Hubba Bubba -- that last one was cool because it didn't stick, even when your giant bubble smashed in your face. Apparently Bubbilicious was a British (Cadbury) import to try and capitalize on Bubble Yum's fame. And Hubba Bubba, always an also-ran, was taken off the market in the 1990s, but came back in 2004. Anyway, I always thought Bubble Yum was the Coke to their Pepsi and RC -- in other words, the best of them all. There was a weird urban legend rumor about spider eggs being in the gum. I not only never heard that rumor growing up but I don't even get it. Why would that even seem a likely addition? Snopes gets really into explaining exactly that. Anyway, the company had to spend $100,000 and take out ads in newspapers all over the country (like kids read newspapers?) to combat it. Still, an awesome kid treat, and one of the true innovators in junk food. All hail Bubble Yum! Blueberry Hubba Bubba is still my all time favorite. I think the spider egg thing came from the actual crystals of sugar you could feel crunch as you started chewing this gum of the gods. Grape Bubble Yum may be the best pure "flavor" ever! Yup around the end of the school year 1977 and summer. The bullies would pull pranks like give a gullible person a Bubble Yum. They'd open the Bubble Yum chew for about thirty seconds and they'd gross people out when they'd point and say those (sugar crystals) are spider eggs. Girls were the most gullible, then the queeny male students but I'm not going to mention any names. I liked the Grape Bubble Yum myself.